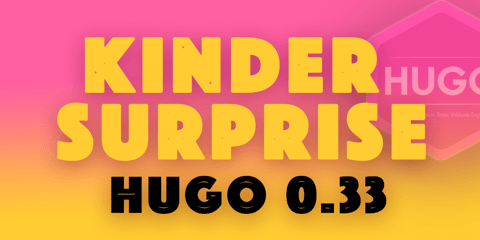 Hugo 0.33: The New Kinder Surprise! This is a full makeover of the layout selection logic with full custom layout and type support (many have asked for this). Also, Hugo now respects the url value in front matter for all page types, including sections. Also, you can now configure uglyURLs per section. But this release is also a follow-up to the 0.32 release which was all about bundles with resources and powerful image processing. With this release it is now simple to add metadata to your images and other bundle resources. This release represents 41 contributions by 3 contributors to the main Hugo code base. We have re-implemented and unified the template layout lookup logic. This has made it more powerful and much simpler to understand. We don’t expect any sites to break because of this. We have tested lots of Hugo sites, including the 200 themes. The indexes type is removed from template lookup. It’s not in the documentation, and is a legacy term inherited from very old Hugo versions. If you have sub-dirs in your shiny new bundles (e.g. my-bundle/images) and use the *Prefix* methods to find them, we have made an unintended change that affects you. See this issue.